Describe what an approval process is. Enable approval requests in Chatter. Describe the steps needed to get started with approvals in Chatter. Create an approval request post template. 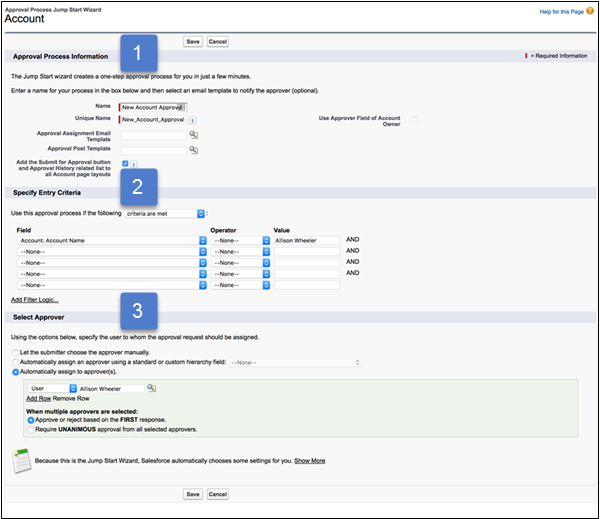 Create a simple approval process with the Jump Start Wizard. Approval processes define the steps to take to approve a record in Salesforce and identify the person who provides approval at each step. You can configure the approval process to send out an approval request as a Chatter post. Because Approvals in Chatter rely on both Chatter and Approvals, getting set up involves more than just turning the feature on. Follow these steps to be sure that everything works correctly and your users see their approval requests as Chatter posts. Create an approval post template. Enable feed tracking for the object on which your approval process is based. Repeat steps 1–4 as needed for all approval processes in your organization. Users who elect to receive approval requests via Chatter receive both an email notification and a post in their Chatter feed. When you enable Approvals in Chatter, users can update their own Chatter settings to opt out of receiving approval requests as posts in their Chatter feeds. Opt out users don't see approval requests in their own feed but can see them in the record's feed. Anyone with access to the approval record can see approval posts in the record feed. Users who opt out of receiving approval request posts in their own feed can see requests in the record's feed. Next, you set up your approval post template. You’d like your approval request posts to be standardized so they always show the same type of information. Well there’s a little advance work you can do to make it so. 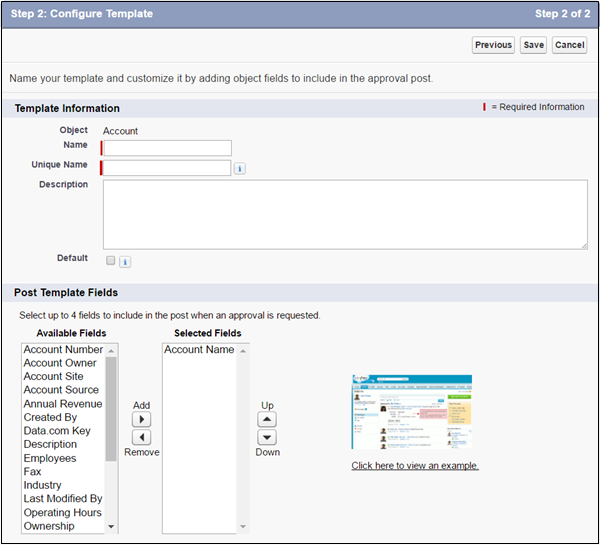 Creating a Chatter post template requires the “Customize Application” permission. From Setup, enter Post Templates in the Quick Find box, then select Post Templates. These approvals are for accounts, so select Account and click Next. Enter the name Account Approval Post Template, and describe it as A template for account approval request posts. Make this template the default for all account approval request posts by selecting Default. For Post Template Fields, move Account Name, Account Number, Account Owner, and Description to the right column. Put text-heavy fields—like Comments or Description—at the bottom. Now you’re ready to define your approval process for accounts. With our post template in place, let’s create a simple approval process for accounts. Let’s say you want the VP of Sales, Allison Wheeler, to approve new accounts and changes to existing accounts that she doesn’t own. Here’s a simple approval process for this scenario. From Setup, enter Approval Processes in the Quick Find box, then select Approval Processes. For Manage Approval Processes For, choose Account. Click Create New Approval Process and choose Use Jump Start Wizard from the dropdown button. Enter a name for the new approval process. Enter a unique name to use when referring to this component in the API. Leave the Approval Assignment Email Template field blank to use the default email template. For Approval Post Template, click the search icon and select the template you created for standardizing the approval request post. Select Add the Submit for Approval button and Approval History Related List.... Your selection adds the button and lets users submit and track approval requests. In the Specify Entry Criteria section (2), set up the criteria the record must meet before it can enter this approval process. In our example, we want Allison Wheeler to approve all accounts she doesn’t own. For Field, choose Account: Account Owner. For Operator, choose not equal to. For Value, enter Allison Wheeler. In the Select Approver section (3), assign all approval requests to Allison Wheeler. Since we’ve named only Allison Wheeler, for When multiple approvers are selected, select Approve or reject based on the FIRST response. Click Save. For our simple example, we don’t add more actions. Click View Approval Process Detail Page. On the Account: Account Approval Process page, click Activate to activate the approval process you created. Our simple approval process is now set up. When someone other than Allison Wheeler submits a new or changed account for approval, Allison gets an approval request notification via email and her feed.